Food truck to a stationary cafe? We’re loving this unconventional restaurants route and the new cafe Around The Corner which is a cosy rooftop space with a menu full of our faves. BTM folks! You’ve got yourselves yet another cosy cafe, and this one’s on the rooftop. 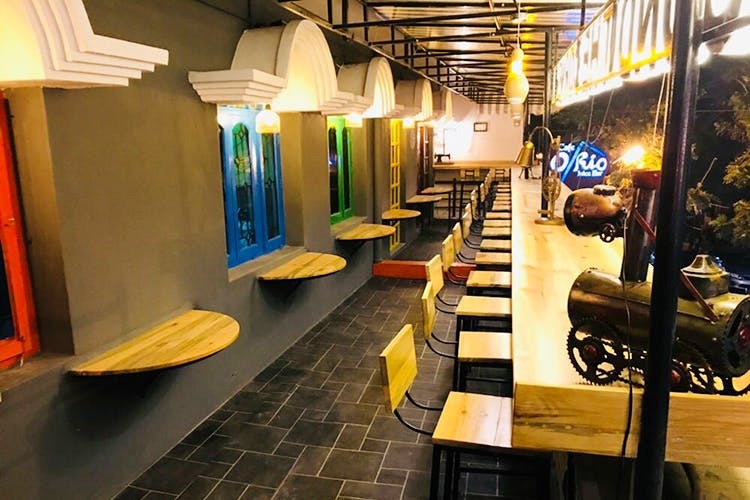 Started by the same folks behind the food truck Too Much Indian, Around The Corner is a new cafe aptly located right around a corner in the neighbourhood. What’s cool about this cafe is that it’s just one long countertop with bar stools that you can perch on. Enjoy your meal as you overlook the roads and building in the BTM Layout. It’s also a great spot to people watch. Just like the food truck, the cafe’s menu boasts of some Indian khana, like many kinds of stuffed paranthas, dals and vegetarian dishes like paneer butter masala and aloo gobi. They even serve a North Indian thali for just INR 70. However, if you’re craving old-school cafe bites, they’ve got those too. Pizzas, burgers, fries, sandwiches and shakes are all on offer. And prices are pocket-friendly, starting at just INR 50. With brightly coloured windows as a backdrop and quirky decor pieces like a lamp made from a repurposed cycle chain and a metal frame of a guitar, there’s definitely some Instagram potential here. But the space is pretty tight and cosy, so you won’t find any tables apart from the countertop, which gives it a nice communal feel, as everyone is dining at the same table. There’s also a cute canopy overhead to keep you cool in the summer heat. Plus, you could always down their delicious cold coffee if it gets too hot.